Somebody else just lost at valet parking roulette... 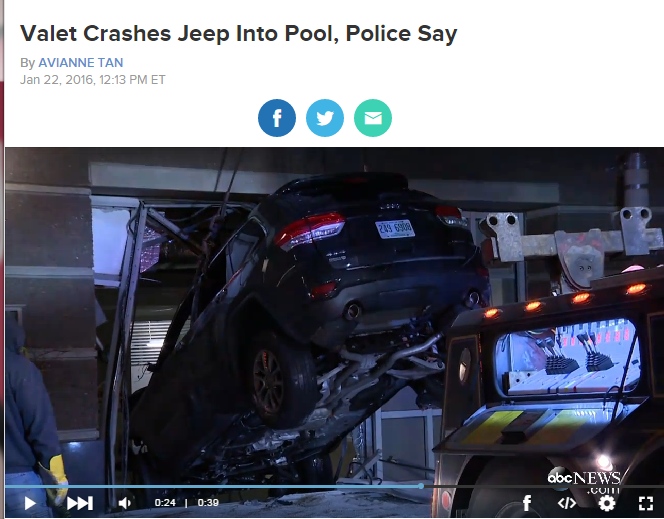 Valet drove Jeep straight into a pool! The valet said the rug got stuck over the Jeep's gas pedal? I'm confused. How does that stop a driver from stomping on the brakes? The reports say he had 100 feet to stop it before crashing into the building and then into the pool. I moved over 10,000 cars when I was a valet. Only once did I encounter a dangerous situation with a gas pedal getting stuck, and that was in an old Land Rover. The way the pedal setup was, I briefly stepped on the gas and the brake simultaneously (with one foot) while maneuvering through a parking garage. Certainly it took me by surprise. But it only took me probably 2 seconds to understand what was going on and how to adjust to stop the truck. I have driven plenty of Jeeps. I simply don't understand how a valet could screw-up so badly... unless they are a rookie. In this case, I can completely understand. I'm curious how long this valet has been on the job? What's the real story here? Did he try to burn some rubber and the tires gripped too much? Did he tap the gas aggressively and then missed the brake pedal? In all of the time I worked as a valet, I can recall no incident where a rug caused one of my fellow valets to fail to stop a vehicle. Okay... a UPI report says the valet slammed his foot down on the gas instead of the brakes. Sounds like a rookie to me! And you know what? Rookie valets are everywhere.